One of the most popular trends in bathroom design right now is ultra-modern with clean, sleek lines and a more European feel. 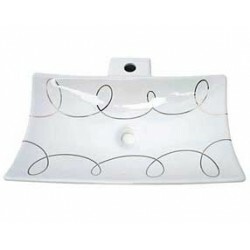 We have created our new line of contemporary decorated sink designs to complement these interiors. We’ve got lots of options in gold and silver and some very subtle combinations of white on white for a textural feel on the fixture as well as some bold, graphic geometrics. 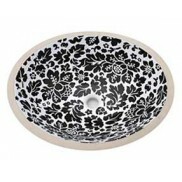 Black & White Chintz flower design on this sink is good for the WOW factor in your bathroom. 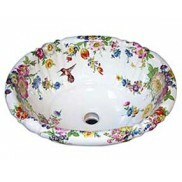 Cle..
Add some pizzazz to your decorated bathroom with this Brocade design painted wallpaper-style on..